Even though no academic or government representative has either personally seen or contacted us in regards to the ensemble of rocks were are custodians of, that certainly has not stopped them from dismissing either its credentials or our motives. Quite simply, because these marked and magic rocks do not fit into the accepted version of past events prior to the Invasion, it just has to be fake or simply down to natural processes. Because of this, the critics can take comfort in their abstinence of contact or engagement, as it is bogus. 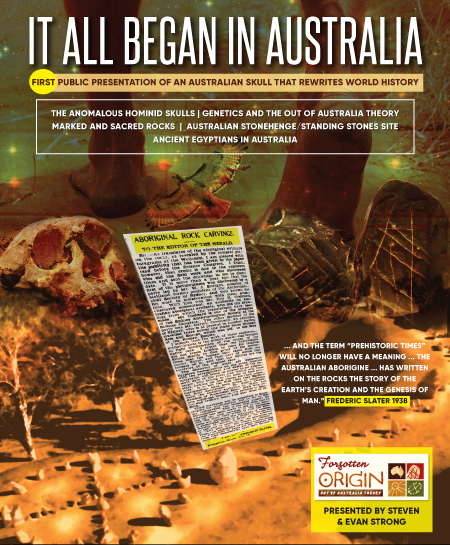 Otherwise the stack of cards they carefully structured would collapse, and all the theories and assumptions detailing human evolution that is their foundation, would be found wanting and totally in error. As we are not acceptable in all academic circles, it logically follows everything we write, study or investigate is tainted by our incompetency and is automatically unworthy. However, what if the rocks are not ours to care for? What if some of these rocks are held and found by others? Does that mean because we may have made contact with them, normally through one degree of separation via email or phone, that the rocks they are protecting are also not genuine? Can it be once our name appears, albeit in the background, all experts must deny without looking or further consideration? And that is the point of this exercise, this article is about the rocks held by others. It is of small comfort that it is not just us, but any bearer of ancient gifts will also receive the same dismissive attitude. It is no more than a reflex reaction as they must change course whenever the truth appears on the horizon. A rock from WA, another from Byron Bay and two which Richard holds that originally came from the centre. 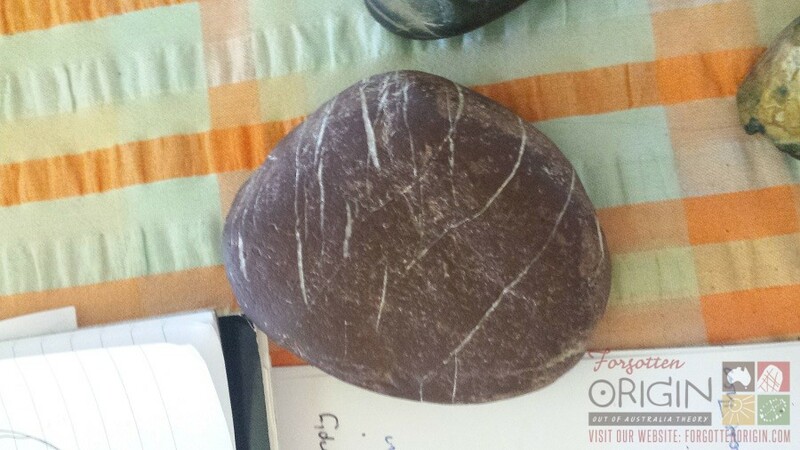 The present holder of the WA rock kindly posted it to me so I could get up close and personal then return to sender, the rock from Byron I have seen twice and Richard’s two stunning rocks stay with him, but I have spent time with them. What they share is all down to one recurring motif, there is technology present on each rock that is not the province of any rock, stick and bone tool kit. What these rocks also share, is that they are not part of the large ensemble we tend and have never sat in sacred formation as a collective, and because of this, they may or may not be part of the rock-tribe when they are given their final sacred resting place. That is an issue to be resolved between the individual rock and its chosen custodian alone, as each rock has its own agenda. That future path, of course, is still to be resolved. To begin with, each person who came upon their rock met with the same blank wall when seeking answers. Whether an outright denial of authenticity or steadfast refusal to embrace the truth of what was engraved, each person made contact with us as either the final choice after exhausting all accredited avenues, or as the only option ever considered. 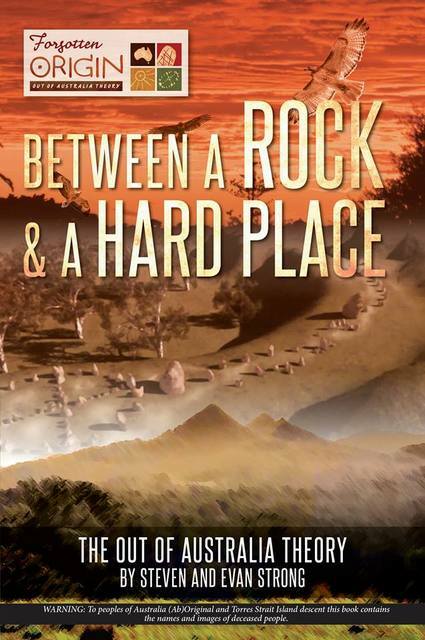 The first rock to be discussed was chosen to initiate proceedings simply because it has so much in common with the intriguing pyramid/triangle rock introduced in the last article on marked rocks. The prominence of sophisticated technology, geometric principles and a very hard surface to engrave upon are repeated, the only real difference here is an allegiance to the curve instead of the straight line. As with the previous rock which is even more elaborate in patterning and geometry, our basic analysis of this amazing rock is meant to be an introduction, as it certainly deserves more. Nevertheless, at first glance there are some obvious features that warrant immediate attention. 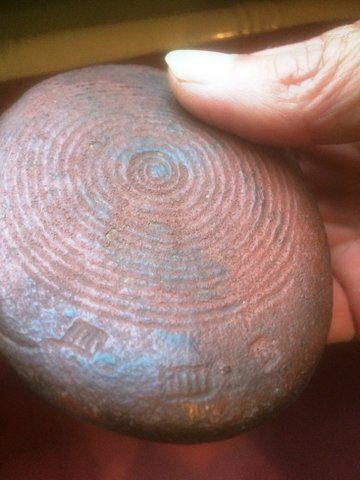 This churinga stone (guardian stone) is the heaviest contender I have seen or held and weighs a touch over five kilograms. The top face measures 17 cms x 16 cms x 13.5 cms x 12,5 cms, and has a very fine grain, as to whether it is igneous or metamorphic is still to be determined. It was recently found on a small sandy ridge surrounded by more sand and swamp at a site very close to the ocean, and it seems reasonable to assume the rock is not part of the immediate geology. We were informed by the person who found the rock partially exposed in the sand, that they were told by a long-time local the nearby area is an Original burial site. If so, this sacred stone placed on the only raised land acting as a sentinel, makes perfect sense. It would have marked a clear demarcation zone in which only those involved in secret business dare set foot. 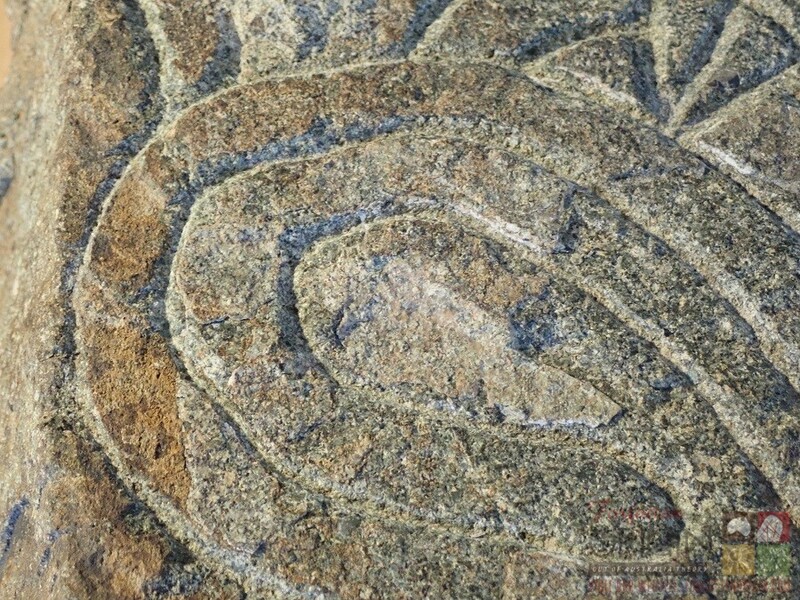 The lines cut into this very hard surface are so similar to those on the previous rock, however, while some are indeed straight the majority are aligned on the bend, forming coils and curves. To keep the spacing between lines on the straight and narrow is feat in itself, but to maintain that parallel width on the bend as the line curves is even more taxing assignment for any mason. We see the same depth and width of cut, so too the steadiness of hand while making a continual cut that literally slides into and through the rock’s surface, is identical. 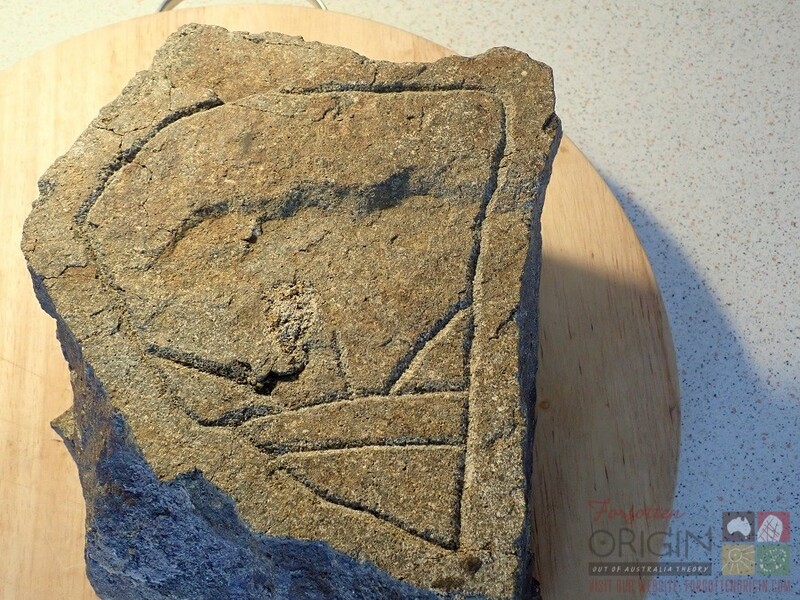 But not so the top veneer, in the triangle/pyramid design there are traces of the familiar black resin/chert coat still attached, whereas on this rock the colouring is light brown and it is not so much a coat, but more a thin glossy lacquer. So, with the top dressing outside the pattern, by our reckoning this rock is not part of the Star Rocks collection. Star Rocks always have lines of specific length, joint meeting places, intersection points and lots of angles, none of this is on display here. The lines remain apart, there are no angles or cross-over points, and no content here that refers to the stars and extra-terrestrial affairs. The ‘bottom’ side also has an engraved message that is markedly different in text and setting. It is primarily a four-sided outer perimeter with a few lines within. Far less imposing and pleasing to the eye than the passage above, the only potential starting point we have is that due to the dramatic difference in lines, coating intricacy and intentions, they are two separate narratives. While the shape of the serpent in the top engraving gives a little more leeway, the plainer rendition is more a blank slate. Another point of divergence is the surface upon which both narratives are engraved, unlike the pyramid rock the slate is clean and so smooth. It has been artificially buffed and because of this intervention with one exception, there are no bumps or kinks on the stone canvas. Placed above the finished work and residual lacquer is grainy mound that was secured to the rock. It is fine-grained, semi-circular and deliberately left rough and untouched. Perhaps it is contact point for the thumb, or it could serve an, as yet, undetermined purpose. 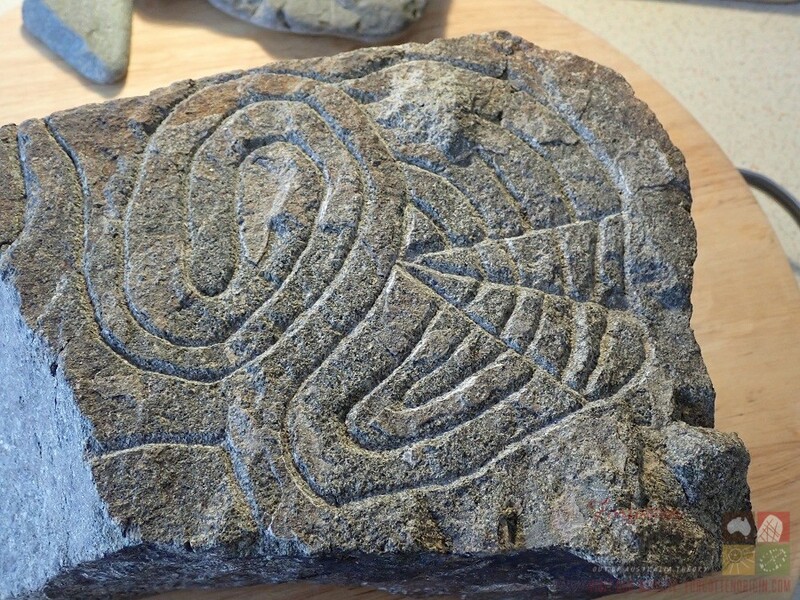 It seems to us that there is the figure of a snake engraved on this rock (Rainbow Serpent), which we feel is the central symbol of this upper design/narrative. If it is the main theme, that alone would explain why curved lines are dominant. 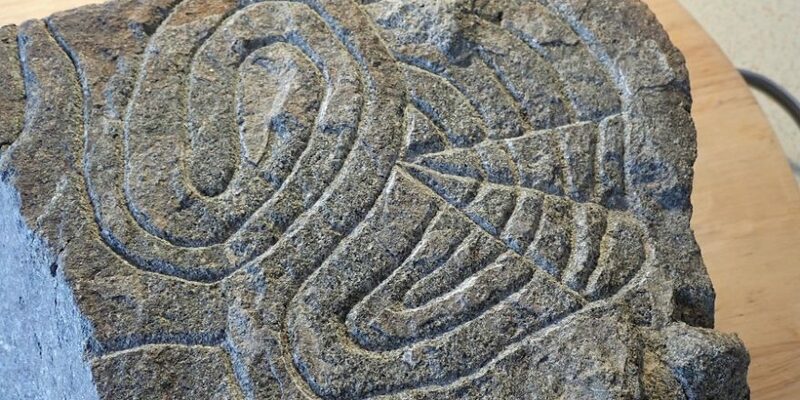 Placed beside the abode of the dead, it makes sense that any such sacred stone would address spiritual concerns, and in the Dreaming, that automatically acknowledges the presence of the Holy Serpent in some form. The present-day custodians of this neglected treasure from the past are empathetic souls who have a fine relationship with this rock. It is stored on a wooden shelf, respected and admired by people fully aware that the rock itself is still present, cognisant of their intentions and actions, and fully capable of expressing its needs and wishes. There is no question mark there, they get it and deserve to be called by the rock. That calling, has caused some concern among some Original Keepers of Old Way protocol, who feel such secret business should be kept silent and hidden. If this country was 100% Original descent as it was before Cook, that argument is strong, but it is now 2% and the other 98% is non-Original, so the players and rules have changed. More importantly, every case of retrieval we have heard always begins with the absolute conviction expressed by the finder, that the rock made its presence known to them. Our point is, we believe them and the rock, so what follows is at the rock’s behest, and that includes the choice of the current custodian. If that changes both the rock and present-day custodians will make that decision. That acknowledgement obviously applies to the couple from Byron Bay, and no less so when dealing with the rock sent from WA. This rock is markedly different from the last rock, and does have a rather unusual colouration rarely seen. Light brown, either as a semi-varnish on the previous rock or as an untreated coat, as it is in this instance, is a colour only seen on one other rock in our collection. Whether that is a regional trend shown by these three rocks, or carries with it a different story, setting or location, is still to be resolved, but either way both rocks share the same general colour. Having said that, this consistency only runs skin deep. This time when the surface is cut a new colour resides beneath, a light cream. As this type of brown coat is outside the norm, we are not prepared to declare it is an artificial addition as it may be the cream rock beneath has a patina that is reddish brown, but that does seem unlikely. It is a different script and nowhere near as exact or regimented as the previous two rocks, with the main face containing three series of diagonal lines. Near the top and against the bottom edge, even though the style differs, both tally seven diagonal lines. The upper sequence of seven lines all slope upward, beginning on a straight vertical line that runs across the main face and continues around the side and back, then returns. Each small line that runs off this line is of a different length, and as the base slopes upward after rounding the corner, three of these lines also continue on and re-join the cut they originated from. From where they begin, and in some cases reconnect, none of the seven lines extend past that horizontal base line, nor do any fall short of it. Each extension and reconnection is a perfect fit, thus discounting any form of natural process as being responsible. The middle horizontal line is very close to straight and has three sloped lines in the same alignment as the upper section. But when descending further there is less precision, no horizontal line to emerge from and no consistency in length. Each line runs over the edge and often well into the opposite face. Also seven in number, but at odds in length, thickness of cut and slope. What is also of note is that there are three widths of incision cut into the surface. The top point was intentionally smashed and broken through impact. It is a very rough separation, and knowing of the sophisticated tools and technology at their disposal, and if desired, the cut could be seamless, but had to be left ragged and open. This is obviously the position where the thumb is to be placed when being held. This light brown marked rock is not a cylcon, churinga stone nor any type of rock that projects energy in a narrow beam. We suspect it to be of a more introspective purpose, where the power manifested within completes a circuit in returning to the human host. The curled thumb position, lack of obvious exit point and the way the hand wraps around the rock when correctly held all suggest it is designed to facilitate some form of interaction between hand and rock. That expectation is reinforced by the fact that once rods and crystals joined the fray it become obvious there is an energy release point and that is exactly where the thumb rests. Adding to that experiment, for the first time ever when my wife held her personal crystal near to this rock, the reaction was far stronger than mine. Knowing the edict from Original Elders, that only I could touch or care for these rocks, it was a surprise to see such a difference. Then whether through guidance, past experience or both, it dawned on me the rock was not snubbing me, but merely being running true to an innate gender preference. It is a female rock. The use of crystals and rods is now part of each rock examination. It is done mindful of the derision such a choice in measuring devices creates in academic circles, but the reality is when measuring the esoteric realms, mainstream is in denial and has no machine or means of detection in their medicine chest. Quite simply, outside crystals and rods, which in our case has an incredibly successful track record, there is nothing else to take onto such hallowed fields. 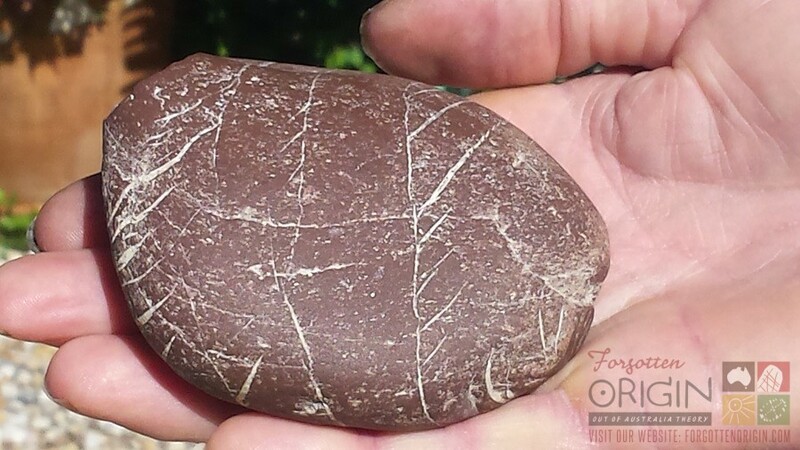 I have seen Richard’s rocks at work, many times, and they are genuine, functioning and fully aware. In validating something that I have seen when in Richard’s hands, that tired old reflex surge of hesitation, verging on cringing, returns. It still seems so weird and irrational to declare that some of the sacred rocks are fully aware of our actions, thoughts and real intentions. And, in adding an impossibility into a base of improbabilities, they can physically act on humans through either venting their disapproval or blessing the holder. Even more importantly, all of this is not lost in the past tense, these rocks can, under the right conditions, share their wisdom with the present human host. All of the above sounds so ridiculous, yet it is so, so true. There are two parts to these sacred rocks, what can be seen on the outside veneer and that which lays within. 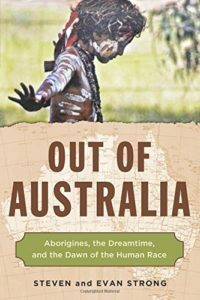 Even before looking deeper, there is more than enough on the surface to question fundamental beliefs in relation to the level of technology in this country supposedly reached before the British Invasion. Just as it is with the curling Serpent narrative, nothing here intersects. With no-cross-over motif on show, along with the absence of any trace of the dark resin and chert top coat which is so typical of the Star Rocks collection, suggests that neither rock is part of that genre. Nor do they it strictly speaking fit into the magic rocks and cylcons classification, as these types of rocks focus more on the shape, point of exit and the thumb-print generating a symbiotic relationship between rock and human host. 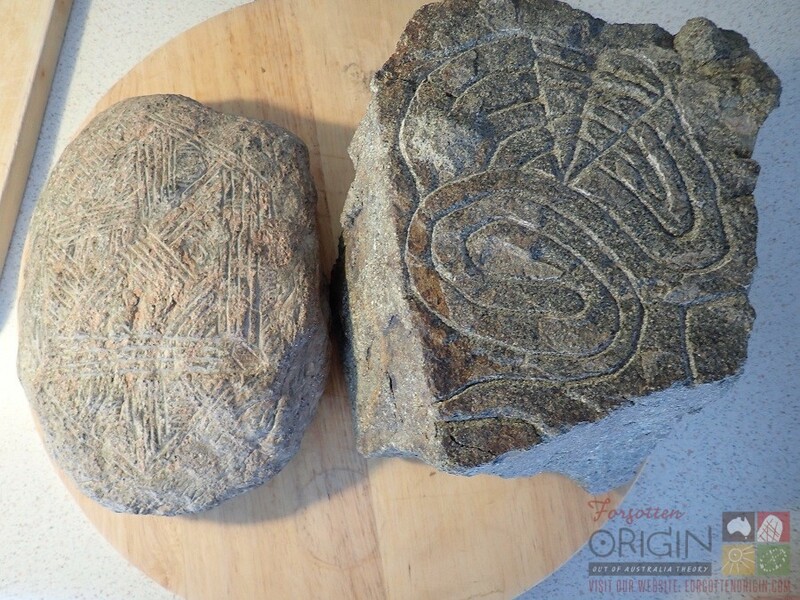 The script of mystical rocks is marginal or not there, while these two rocks are covered with many markings they are primarily magic in application. They are a cross-over of two types of rocks, and to an extent, stand alone. The immediate focal point in each rock is certainly the finely grafted sets of expanding circles. The spacing and gap between each line is replicated and requires the hand of a skilled mason. The consistency of curvature and line without the hint of a join or straight blade denies any contribution by a chisel. The lines were cut without any relief or break in the lines, and there has to be a blade responsible. But the cutting edge cannot be wood, bone or stone, as the rock and its surface is too hard, the tool responsible has to be metal or better, nothing less would afford such consistency in gap, depth, width and accuracy. As is often the case with these rocks, it takes some time to acquaint oneself with the multiplicity of messages and clues upon and within. Around the outer edge of the collection of expanding circles are symbols that sometimes resemble what looks like bar codes. Obviously, this is not a shopping list, but no less evident is an incredibly complex expression of something that is crucially important and so missing in recent days. 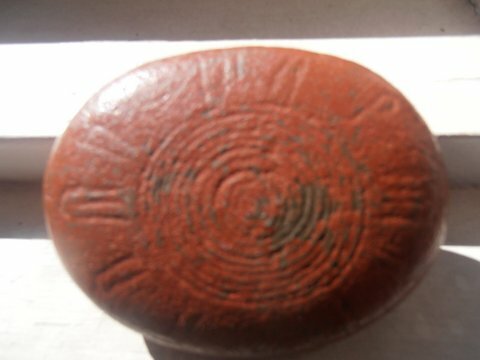 How these accompanying signs were created, along the inner rings demand a very sophisticated technology applied on the surface, but that is merely an introduction to the ‘main course.’ It is the spiritual activities associated with these two rocks that is front and centre, is this exchange between Richard and rocks. And as these rocks are under his custodianship, rather than pass on second-accounts, why not go to the source? That is the point of this exercise, not one of the rocks discussed belongs to the collection we are tending. They all share one common denominator, in that they are with someone else and are kept somewhere else. Every person was called by the rock, and totally believes that happened, and also does not question the existence of an inherent power within. Some people, along with many scientists and academics, would strongly object in denying that these rocks have an awareness, connection or the capacity to store any form of energy. But Nature would be compelled to object, in that uranium ore and many other ‘ium’ strands emit a constant stream of radioactive energy, which can be detected by a machine. 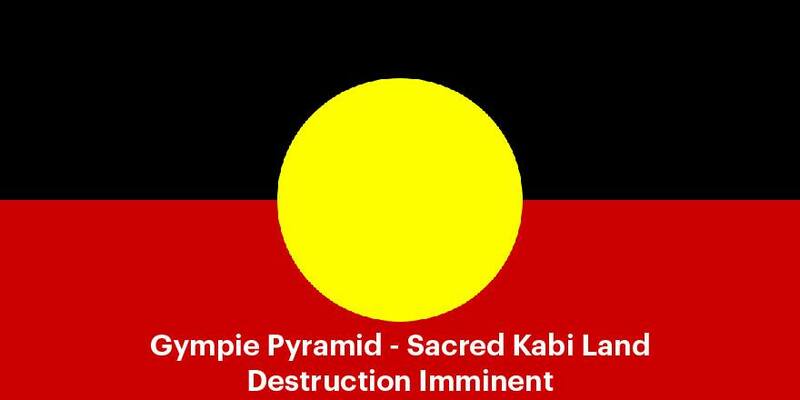 This surge of energy is not a one day event, but continues for thousands of years. So, at the very least it can be conceded that some rocks do have an energy we can measure, which means the door is open for other types of rocks. If one family of rocks can enter, why not others? What if other rocks discharge a different, and as yet, unmeasurable form of energy? 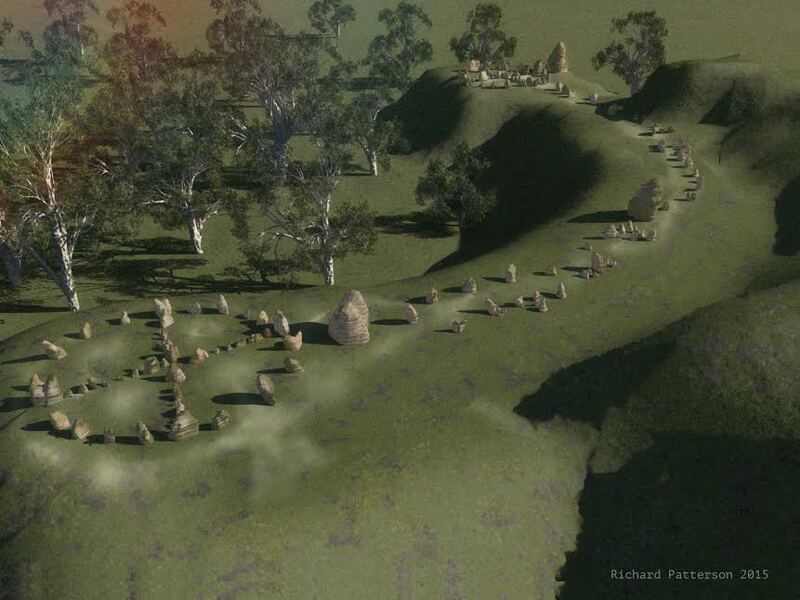 Irrespective of within and upon, these rocks were made and engraved in Australia by Original people. They belong to the Dreaming and are returning now to reclaim their past heritage and future roles. In the long run, whether or not they are officially recognised is irrelevant, come what may these ancient rocks are part of an ancient blessing and renaissance in days soon to come, that will prevail.